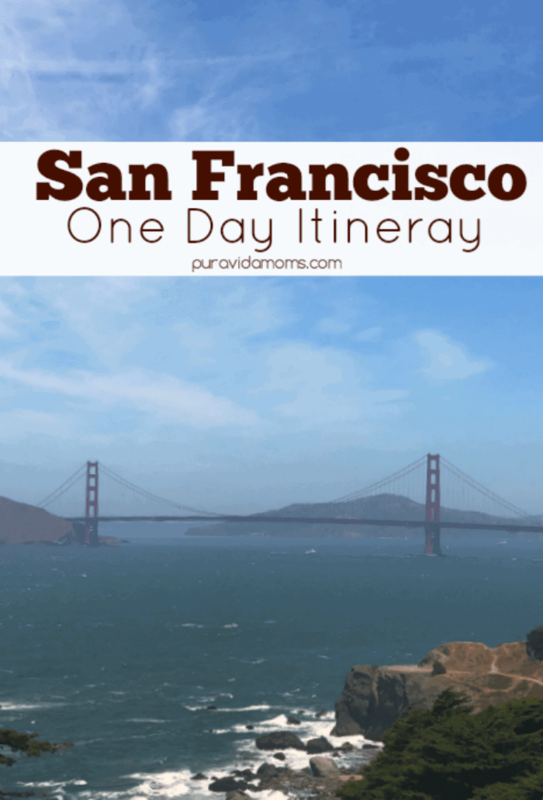 The City By The Bay definitely warrants lots of travel time- but if you are like me and only have one day in San Francisco, here is the perfect itinerary! 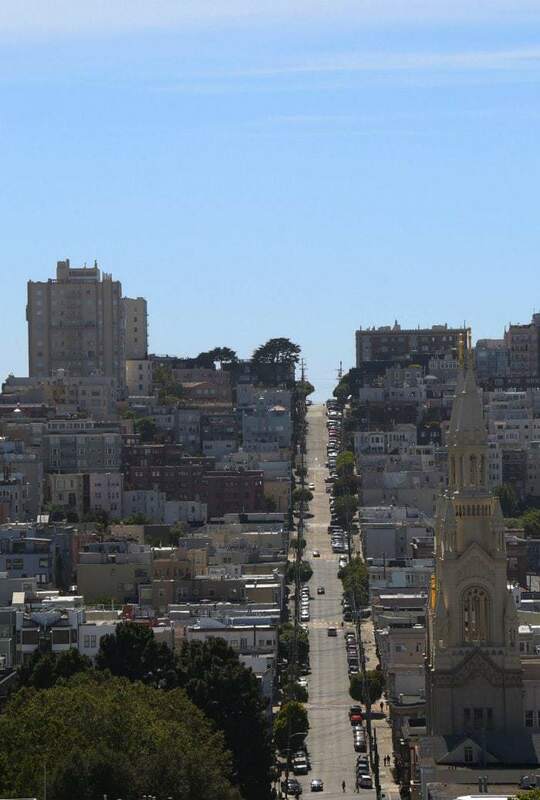 I was so lucky to spend one day in San Francisco this year. I was attending the first ever annual Pinterest conference, (which was amazing and I learned so many great Pinterest tips!) and I had never been to San Francisco before. I decided to fly in a day early to explore the city on my own. And let me tell you- I did ALL the things. 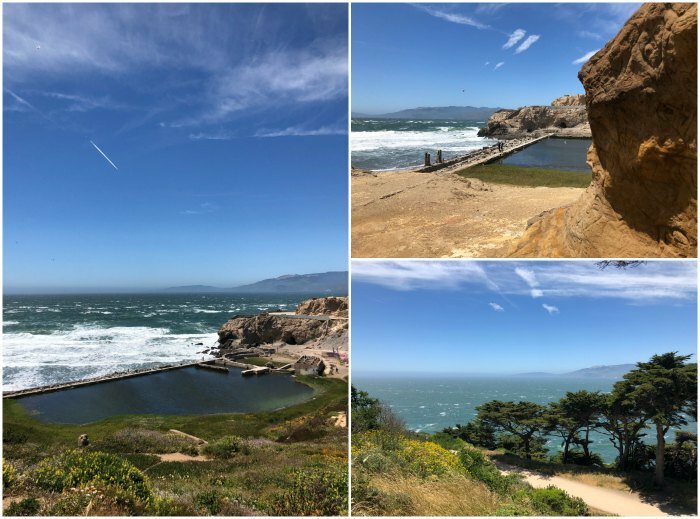 Before I arrived for my one day in San Francisco I did a ton of research on the top places to see in the city- and then I did it! 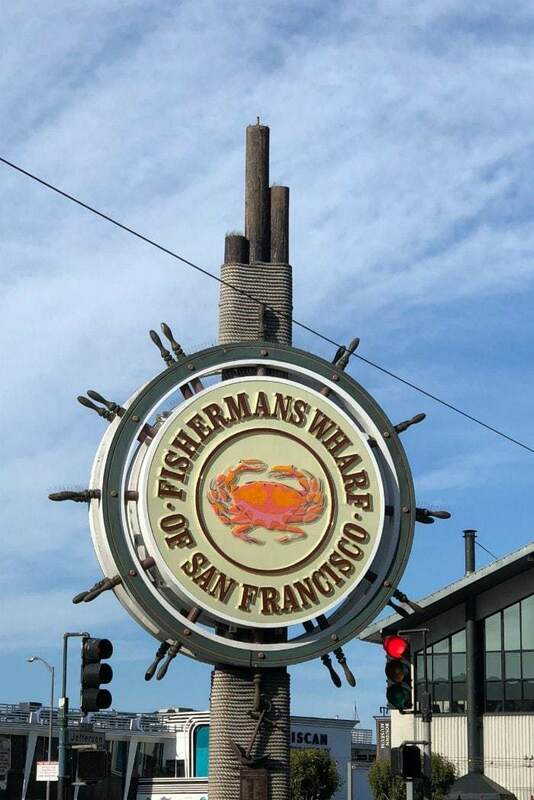 I’ll share my itinerary with you here so that you can replicate my day trip if you find yourself short on time and long on adventure in San Francisco. This itinerary is for about 8 hours, or one day in San Francisco. Hours 1 and 2- I arrived at the San Francisco airport and hopped on the BART train to Powell Street Station. I was staying downtown and wanted to drop off my suitcase before exploring. The train was a bit confusing to get my ticket but super worth it because my trip downtown only cost $9.15. I simply followed the signs to the BART- I had to ride an internal airport train and then enter the station. With the BART you have to know your final destination stop and count the number to stops until you get there. You then purchase your ticket and board the train. If you get to your final destination and you are short on fare, the exit machine tells you how much you need and you can just add it and get out of the station. I will say that I felt super safe on the train traveling alone as a woman. I arrived at the Union Station stop and navigated uphill to my hotel. There were tons of people downtown and again, I felt really safe with my suitcase and there were other people there. The main trolley stop is right outside of the Union Square station, and there is tons of shopping and dining. 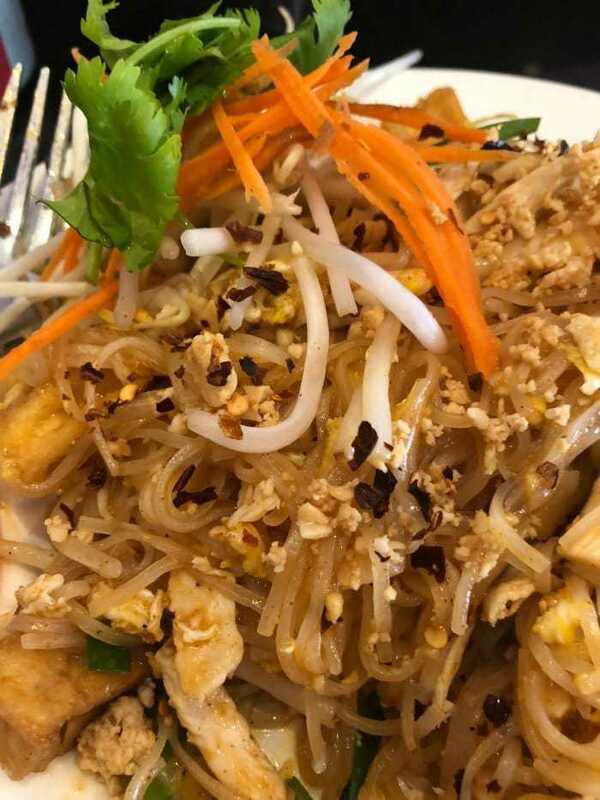 I wanted Asian food in San Fran, and so I found a hole in the wall Thai place called King Of Thai Noodles that was phenom. Hour 3– After dropping my suitcase and packing a daypack in the hotel (I had a water bottle, camera, phone, book to read and warm clothes- check the weather before heading to San Francisco because it can be colder than you think) I grabbed an Uber out to Land’s End to do some hiking and check out some long views of the Golden Gate Bridge. I have always dreamed of seeing this iconic American landmark- and I was not disappointed. The Uber drive mid day was about 20 minutes. Hiking at Land’s End was awesome- and again I felt super safe as a solo female traveler. There were lots of people and families exploring, and there is tons to explore. Plus, I always love visiting the ocean when I’m on the coast. There is an iconic restaurant and souvenir shop here called The Cliff House- my friends visited for a sunset dinner and said the food and views were amazing. There is also a great view of Ocean Beach from the top of the hill here. Hour 4- To continue my one day in San Francisco, I grabbed another Uber and headed to Coit Tower. The views came highly recommended to me and I was not disappointed. 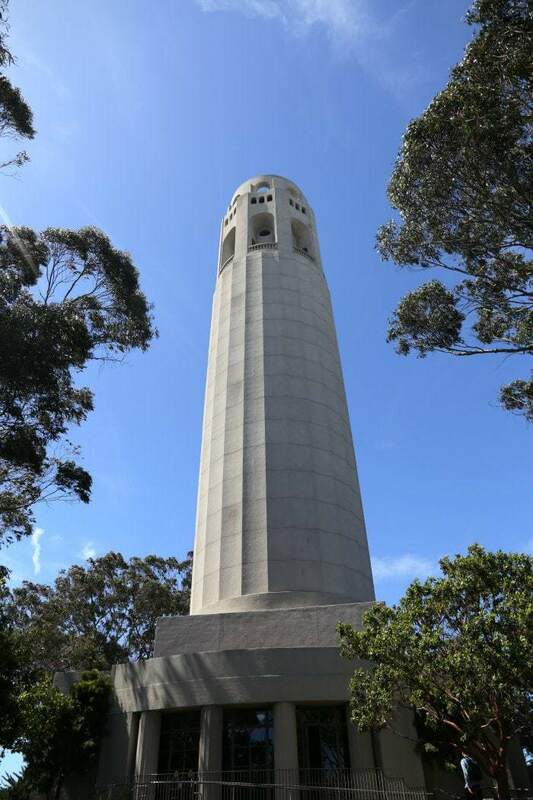 This was only about a 10 minute mid day drive from The Cliff House, and it was fun to drive up the narrow and windy streets to the top of Coit Tower. I used the bathroom here and refilled my water bottle, but didn’t go up into the tower. From the grounds there were sweeping views of the Golden Gate Bride and the Oakland Bay Bridge, and I could see Lombard Street. I checked Google Maps and it was only about a half mile walk down Telegraph Hill to Lombard street so I headed that way on foot. I stopped at a cute Italian bakery for a Diet Coke and some fresh baked cookies on my way to Lombard Street- passing Washington Park. Please do note that walking in San Fransisco is not for the weak, haha. 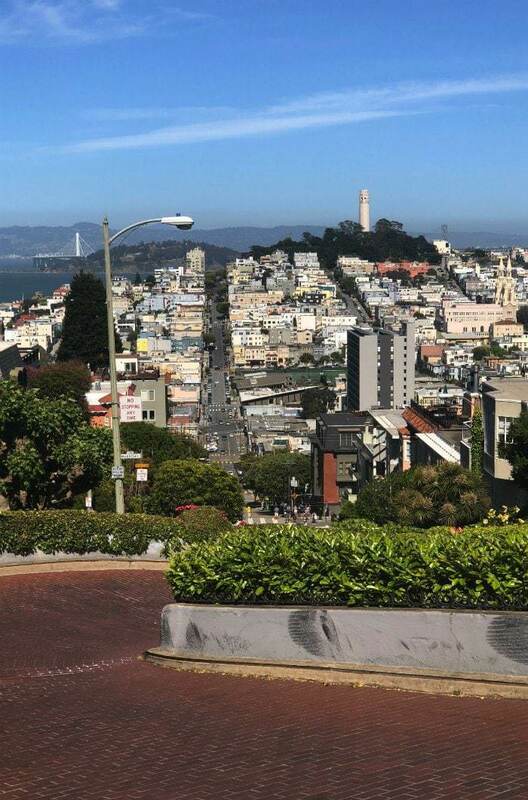 I walked pretty much straight uphill for 6 blocks to reach Lombard Street- I was sweating and my heart was racing when I arrived at the bottom of Lombard. It was a memorable and fun experience though! Lombard Street was a riot. It’s a complete tourist attraction- there were cars driving down and on the day I went, busses upon busses full of Asian tourists being let off at the bottom. I walked to the top, took some fun shots, and enjoyed the people viewing experience. There was a trolley stop right at the top of the hill, and I really wish I would have just hopped on and rode it down the street. 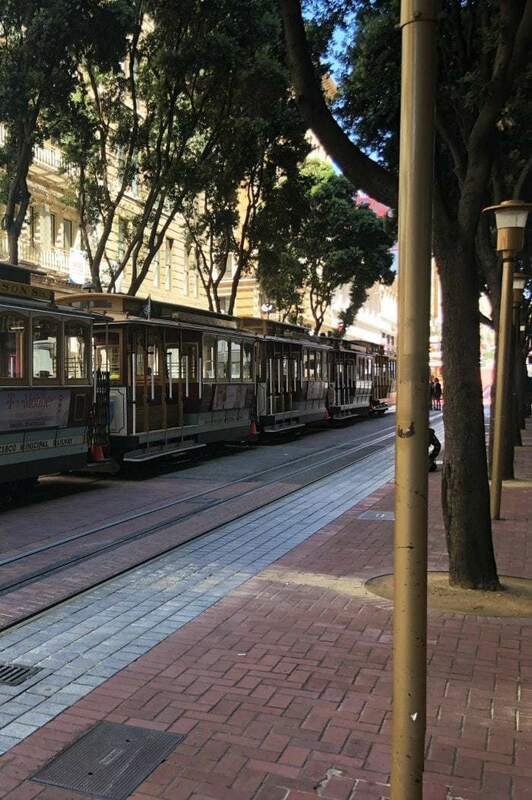 One of the people I met later said that true San Franciscans just hop on the outside of the trolley and ride hanging on the railing until the trolley driver tell them to get off. I wish I had done that. Hour 5- I grabbed another Uber and headed to Crissy Field. I found an Uber Pool pickup near Lombard Street and put in Crissy Field. The other woman in the pool was dropped off at the Sports Basement and I saw they had bike rental. So I hopped out of the Uber and grabbed a rental bike. The man working there was incredibly helpful and told me all the best places to see near Golden Gate Bridge State Park on my bike, and Fisherman’s Wharf was just about a 15 minute bike ride away- and I could leave the bike at the Wharf. Sold. 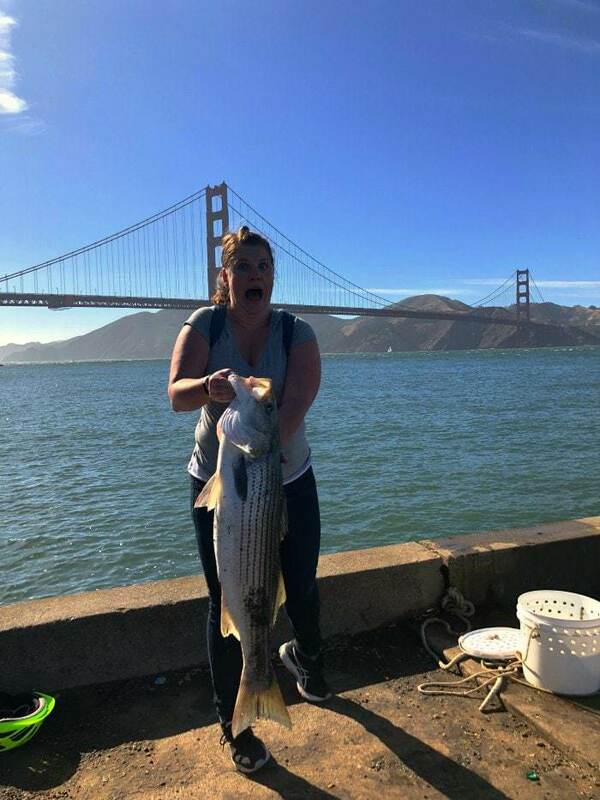 A local fisherman MADE me hold this huge fish- it was hilarious. Hour 6- After leaving my bike, I grabbed an Uber Pool to Union Square BART stop, as I was headed to Oakland to meet a friend. I didn’t spend much time in Fisherman’s Wharf and if I weren’t meeting my friend I definitely would have spent the end of my one day in San Francisco wandered the Wharf, hit up Ghiradhelli Square, (which San Franciscans HATE by the way) and then taken the trolley back to Union Square to eat dinner in Chinatown as the sun set. But- friendship first! Hours 7-8 I hopped on the BART at rush hour to Oakland. It was the weirdest experience- I have bene on trains all over the world but this train ride was a first- it was literally silent. I was jammed in the standing room only car with professionals plugged into their headphones. It was so weird to me- I feel like public transportation can build a camaraderie among riders but there was none of that on this ride. I spent time in Oakland with my dear friend and she took me to eat at Duende. It was absolutely delicious and cozy and worthy of every great review. (Side note, I also ate at Flour + Water another night and it was one of the best meals I have ever had in my life.) I took the BART back to Union Square- and it was a bit late (9:30 pm on a Monday) and there weren’t many people in the BART station (lots of rats though). I probably would have felt better on this trip back in an Uber- but I wasn’t unsafe there just weren’t a lot of people around. 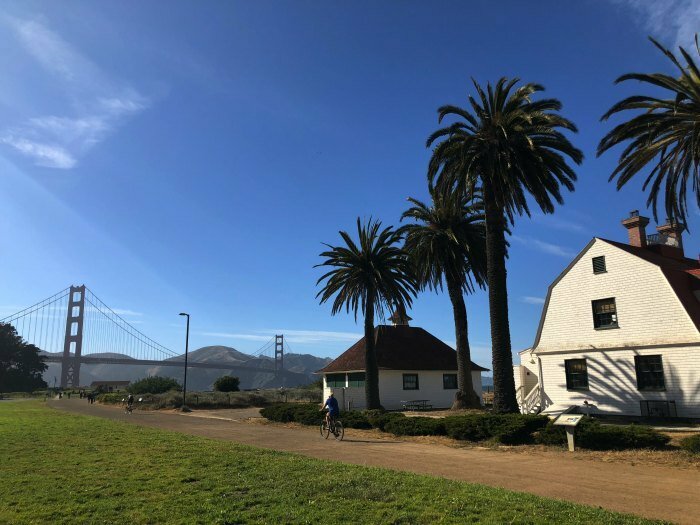 Note about the itinerary– if I were to do this trip again, I would probably come to Golden Gate Park and Fisherman’s Wharf and do the bike rental BEFORE doing Coit Tower- just switching those two stops. I think it would have saved me Uber money and some time. Note about Uber– Uber it is huge in San Fran, and I spent over $50 on this day. Not ideal, but I was in a time crunch and wanted to see a lot. I also met a ton of really nice local drivers and was able to get from pint A to point B faster than I could have on public transportation, and I never had to worry about parking like I would have if I had rented a car. Uber Pool is also great in San Fran- you pay a cheaper fare and ride with other people going to a similar destination. I was in one car where a woman was literally on a conference call the entire time. IT was so weird- but cheaper and interesting to hear her side of the convo. On my next trip to San Fran I would definitely hit up Chinatown- I hear nothing but great things about having dinner there. I also wish I had seen the fun houses from the opening credits of the old show Full House, and I would love to cross the Golden Gate Bridge and ride the trolley. 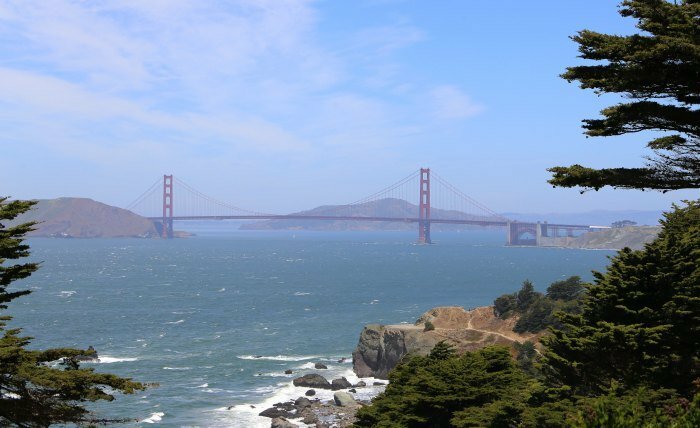 I’ve also heard that wandering around the ritzy neighborhood The Marina is super fun, as is Golden Gate State park. Hopefully I will be able to return soon- and with my family too- here’s some great tips for San Francisco with kids! Looking for other travel tips from Pura Vida Moms?